I believe I mentioned before that I’m celebrating my release from academic administration by trying to read a library. I’ve been focusing on recent books, and I’m on a mini-run of political books. In that context I’ve recently finished Chris Hayes Twilight of the Elites — I have some nitpicks, but much more admiration, and I hope to blog about it soon; Christopher Hedges and Joe Sacco’s Days of Destruction, Days of Revolt — again some disagreement, but a must read nontheless. Along the way I’ve been looking at some books calculated to raise my blood pressure in other ways — Ross Douthat’s Bad Religion — which I found to be not really worth bothering to argue with (such an embarassing display of poor historiography)! I’ve also been dipping into Charles Murray’s Coming Apart, which combines an insight he shares with Hayes and a commitment to a prior conclusion that drives his core argument spectacularly off target. * Still, it’s useful to get some sense of how the other side thinks and argues. I do hope — I’d say plan, but I’ve learned how regularly day job stuff rises to intervene — to blog about at least some of these down the road. But I’ve just started the next book in the programme, Thomas E. Man and Norman J. Ornstein’s It’s Even Worse Than It Looks. The second [of two sources of dysfunction in current American politics] is the fact that, however awkward it may be for the traditional press and nonpartisan analysts to acknowledge, one of the two major parties, the Republican Party, has become an insurgent outlier — ideologically extreme; contemptuous of the inherited social and economic policy regime; scornful of compromise; unpersuaded by conventional understanding of facts, evidence, and science; and dismissive of the legitimacy of its political opposition. When one party moves this far from the center of American politics, it is extremely difficult to enact policies responsive to the country’s most pressing challenges. I’d quibble with only a couple of words there. As I say. Quibbles. As a matter of sense, this is right on — made the more potent given who writes it: not a DFH like yours truly, but truly seasoned, deeply centrist, long term observers of the institutions of American politics. None of that matters. “Good” Republicans are mere useful idiots, providing scraps of cover for the radical authoritarians wielding the real power. The party is committed to public policy stance that is destructive, both of American prospects and those of folks all around the world. They must be driven so far from the political arena as to be destroyed, until whatever emerges from its wreckage, even if it persists in operating under the label “Republican” is utterly transformed from the catastrophic clown show we now watch in horror. Oh — and one last thing. There are, I know, lots of flaws one can point to in the Obama administration. There are plenty of warts on the Congressional Democratic caucus. But the two parties are not the same and the consequences of getting it wrong this time are simply huge. The politics of purity may be satisfying, but this time around such delicate sensibilities are a luxury we simply cannot afford. And a very cheerful Sunday to you too. 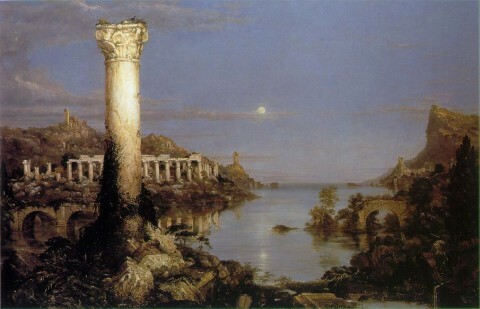 Image: Thomas Cole: The Course of Empire: Desolation, 1836.